Shaw was at the height of his popularity in 1914, when this picture was taken. Pygmalion had been produced, to great success. But the War was to bring change to his life, as to so many others. We shall have to fight and die and pay and suffer with the grim knowledge that we are sacrificing ourselves in an insane cause, and that only by putting up a particularly good fight can we bring ourselves out of it with credit. […] For the present time there is only one thing to be done besides fighting … and that one thing is to set to work immediately to draft the inevitable Treaty of Peace which we must all sign when we have had our bellyful of murder and destruction (quoted Holroyd 448). In any ordinary time I should have been delighted to publish your letter with every word of which I agree, but at this horrible time one has to consider so many things which one would like to ignore. […] Your letter would be highly disturbing to many minds. That of course is the object of it and a very excellent object. But I suppose one’s duty now is to encourage and unite people and not to exercise and divide (quoted Holroyd 449). 1. It would be bad for future peace in Europe if France and England (Shaw often says England when he means Britain) were not able to defeat Germany on their own, without Russian help. 2. France and England have to live with Germany after the war, and to cripple Germany by exactions and humiliations would be a serious mistake. 3. Anyone who thinks that war is in some way good for a nation should be shut up in a mental hospital. 4. Both England and Germany were involved in an arms race for years before the war, and neither should claim any moral superiority. 6. It should be admitted that there is no trustworthy evidence that the Germans have committed worse atrocities “than those which are admitted to be inevitable in war or accepted as part of military usage by the Allies”. The Germans destroyed Rheims cathedral; but if the French had put an observation post on the roof this is hardly surprising. “The injury to the cathedral must therefore be suffered as a strong hint from Providence that though we can have glorious war or glorious cathedrals we cannot have both” (WSRS 84). Common Sense appears to be largely common-sensical today, but Shaw’s advice did not go down well at the time. Asquith’s son said he should be shot; J.C. Squire said he should be tarred and feathered. Bookshops removed his books; papers suggested that people boycott his plays. Even people he thought were friends, like Chesterton and Wells, turned against him. More Common Sense about the War, written in early 1915, was rejected by the New Statesman, and until edited in WSRS it languished as a manuscript in the British Library. Other writings by Shaw about the war include “Glastonbury Festival and the Military Authority”, which appeared in the Western Daily Press on August 29 1916, which lambasted the decision to turn down an appeal for exemption from military service by a composer and organiser of music festivals, Rutland Boughton. His work, he was told, is “not of the least national importance” and not such “that the Army should be kept waiting for his services”. I repress my natural impulse, as an artist and man of letters, to describe this as pompous insolence. I recognise it as honest barbarism. But, I ask, is the Army really being “kept waiting” for Mr Boughton’s services? Are we really being held back from Bapaume because the British Expeditionary Force is paralysed by the absence of a solitary man of thirty-eight, no bigger physically than Beethoven or Wagner, who can handle a grand piano or a conductor’s baton like a master, but does not know the right end of a gun from the wrong one? Is it true that General Haig cannot make shift without him; for that is what being “kept waiting” means if it means anything? (WSRS 177). In 1916, Shaw wrote a preface for Leonard Woolf’s International Government, which had been commissioned by The Fabian Society’s Research Department. It argued that the first step towards the prevention of war in the future was the setting up of an international body, over the nation-states. It was the first glimpse of the League of Nations, an idea that Shaw lauded in his preface. In January 1917, perhaps surprisingly, he received an invitation from General Haig to visit the Front. His reports, published in the Daily Chronicle 5-8 March 1917, did not go down well with everyone. He made interesting points, but often in a jokey manner that some found offensive. He assured people that death was by no means certain at the Front: gas would often blow the wrong way, and high explosives were very imprecise. The cathedral at Arras “looked better as a ruin than when it was intact” (WSRS 197). (When Shaw reprinted these pieces in 1931, in his What I Really Wrote About the War, he added the following comment in brackets: “the British bombardment of Dublin beat it hollow; but I resisted the temptation to say this just then” (WSRS 302). “A man lying by the roadside was not a tramp taking a siesta, but a gentleman who had lost his head. […] Well, in time of peace he might have lost it much more painfully and mischievously. There are worse ways of ending one’s walk in life” (WSRA 196). More seriously, he remarked that economics would end the war, not military strength. He reminded people that artillery shells were not only imprecise, but extremely expensive. Waste is the law of modern war; and nothing is cheap on the battlefield except the lives of men. […] Therefore, my taxpayer, resign yourself to this: that we may fight bravely, fight hard, fight cunningly, fight recklessly, fight in a hundred and fifty ways, but we cannot fight cheaply. That means we that we must organise to increase our production. Mere saving wins no battles (WSRS 204). After the war, the selflessness of the soldier could be the saving of the country: in the army “you are continually trying to get things done in the best possibly way for the benefit of your comrades in arms, of your country, of the whole of which you are part. … whereas commerce is normally competitive and places your individual pocket before all the higher objects of ambition” (WSRS 210). One MP asked in the Commons whether GBS was the right sort of man to be officially invited to the Front; there was speculation whether he was sent there just to advertise Britain’s famous freedom of speech. He wrote O’ Flaherty, V.C. : A Recruiting Pamphlet in 1915; it was first performed in Belgium in February 1917; a long way from the censor. It was his satirical response to the plea from the Undersecretary for Ireland to help out in recruitment of the Irish for the Army. He wrote Augustus Does His Bit in August 1916, for the Belgian refugee fund. It satirised the incompetence of the aristocratic officer class, and went down better at the Front than in London. In 1916-17 he wrote Heartbreak House, which is set in southern England at the time of the outbreak of war. Its preface, which was written in 1919, oddly proclaims that he started the play before the war (which does not seem to be the case): “When the play was begun not a shot had been fired; and only the professional diplomatists and the very few amateurs whose hobby is foreign policy even knew that the guns were loaded” (WRRW 2). 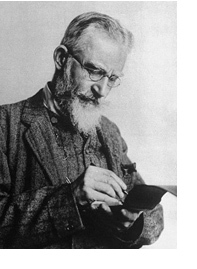 I have used Michael Holroyd’s Bernard Shaw: The One-Volume Definitive Edition (London: Vintage, 1998), and J.L. Wisenthal and Daniel O’Leary, ed., Bernard Shaw; What Shaw Really Wrote About the War (Gainesville etc: University Press of Florida, 2006) (abbreviated as WSRW).